Planning an English country ramble with the family? Take a break from pork pies or fish and chips with a gastronomic experience at La Manoir, complete with a special activity for children. Le Manoir, located in the picturesque, oh-so-English Oxfordshire village of Great Milton, is one of Britain’s finest gastronomic experiences. 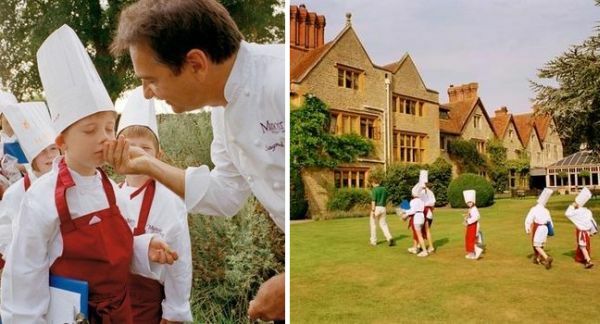 Created by celebrated chef Raymond Blanc, Le Manoir has held two Michelin stars for an incredible twenty-seven years. Le Manoir also boasts luxurious, individually designed guestrooms and is surrounded by superb gardens. So what’s on the menu for kids? Cookery classes! Not many children can say they trained in a two Michelin star kitchen. Raymond Blanc has created a cookery course for children that is fast, furious and fun. Budding chefs learn kitchen techniques, explore La Manoir’s extensive kitchen garden and orchards, create a lunchtime feast and then spend an afternoon enjoying sweet treats – cooking the perfect soufflé, chocolate tasting and making one of Raymond’s favourite childhood desserts, ‘Floating Islands’. Also available are adult and child cooking classes where together you learn the art of kitchen teamwork to create dishes to share. You don’t have to be a hotel guest to take cookery classes at La Manoir. The children’s one-day class is £260 per child. The adult and child cookery class is £520 for two. Extend your La Manoir experience by staying in one of the unique rooms or suites (suites that can accommodate children begin at £700 per night.) Bookings can be made online.